The permanent collection of the Gerald R. Ford Presidential Library & Museum contains approximately 20,000 artifacts. Bluecadet embedded a “talkback” feature in each of the programs, allowing museumgoers to give feedback via poll and express their opinions on the content, or how they would have responded to different scenarios. The LBJ Presidential Library has wonderful architectural features like the central archive that creates a large wall. 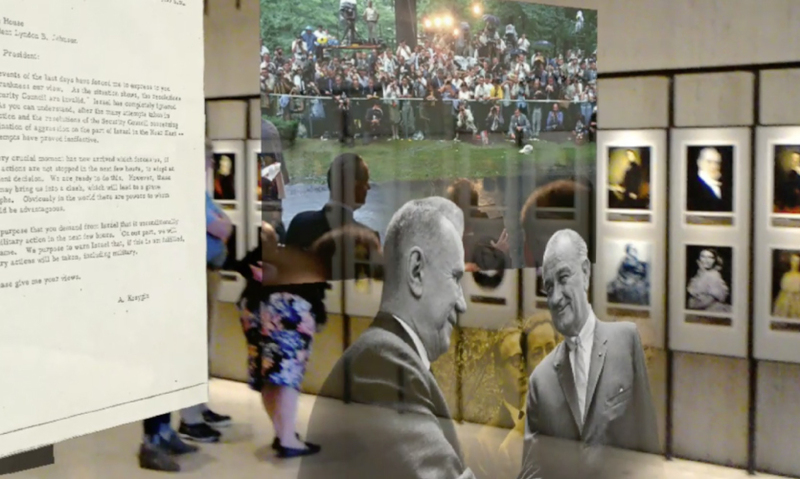 The Cortina Productions-design AR experience allowed visitors to walk up to the archival images and documents, walk around them and get as physically close to the story as they wanted. Since the windows are higher than most visitors’ natural sight lines, we then had the content “fall” from the selected window onto the floor in front of them. On October 28,1979, New York Timesarchitecture critic Ada Louise Huxtable wrote of the John F. Kennedy Library designed by I.M. Pei with exhibitions by Chermayeff & Geismar Associates: "The Presidential Library is a curious phenomenon. Intended originally as the repository for a President's papers and related documents, it was brought into existence by a Federal law which stipulated that a museum be included with the archives. Scholars, anxious to see consistent and reliable provisions made tor the preservation and use of presidential papers, were willing to go along with what they visualized as a few discreet display cases, or perhaps an accessory gallery, containing historical objects and memorabilia. ... What has happened, of course, is that the union of library and museum has gone unexpectedly askew; it has turned into a Catch‐22 shotgun marriage. The museum function has expanded to the point where it has taken over more and more overtly from the archives. The result is an odd architectural couple, with the library serving as an excuse for the museum, which has turned into an enormously popular tourist attraction. The Presidential Library may be the biggest draw since Disneyland." While not exactly the "biggest draw since Disneyland" for most of the American public, presidential libraries, museums and centers increasingly offer fascinating and engaging exhibitions that both honor and examine the lives and policies of the United States' Presidents that are frequently designed by heavy-hitters in the community—from traditional and digital interactive exhibition design firms to fabricators and stone carvers—including The Andrusko Group, Bluecadet, Cortina Productions, Design & Production, Gallagher & Associates, Kubik Maltbie, Marcel Machler, Inc, The PRD Group, Ralph Applebaum Associates and Thinkwell. Take a look through a selection of these interesting centers for history and study, below. The library and museum facility also boasts two auditoria, a research center, archives and administrative offices that remember JFK in a contemporary yet timeless way overlooking Boston's Dorchester Bay. 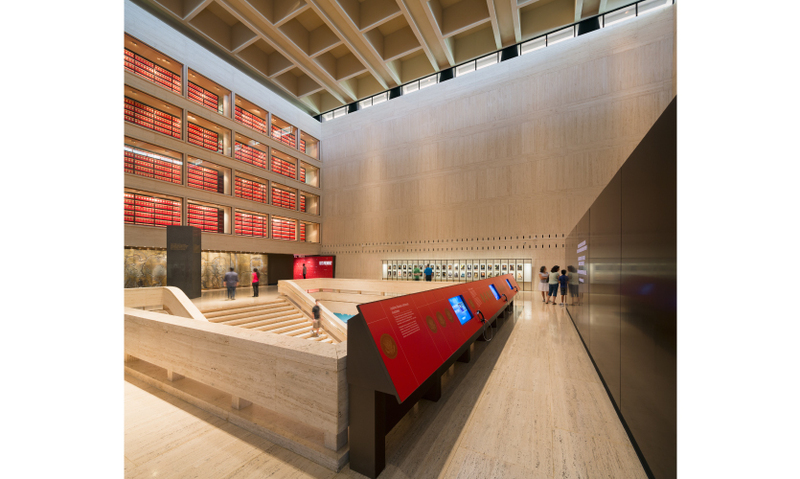 The LBJ Presidential Library—located on The University of Texas campus—first opened in 1971 and was rededicated in 2012. 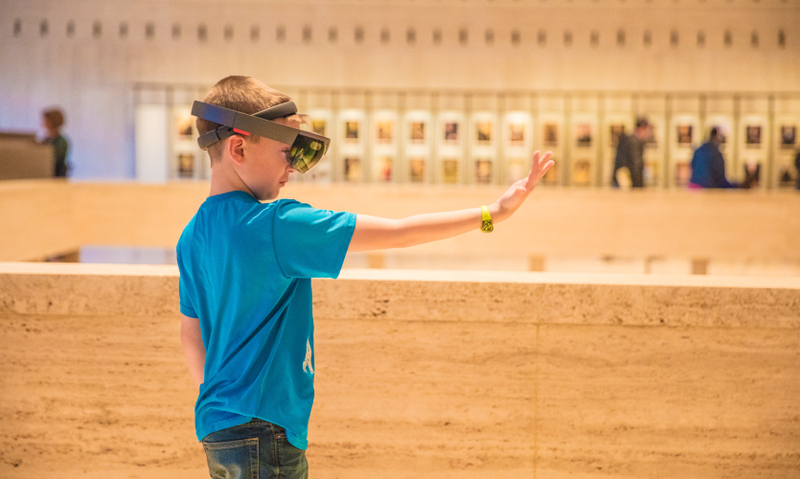 Cortina Productions’ work for the newly designed museum included seven films, five interactive exhibits, and four audio exhibits, and later, a temporary AR experience. The Richard Nixon Presidential Library and Museum reopened in October 2016, featuring a renovated 17,000 sq. 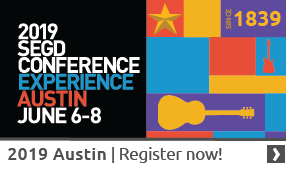 ft. museum and stand-alone theater that brings President Nixon’s life, career, achievements and controversies to life in an interactive and comprehensive exhibition. The Ford Museum in Grand Rapids holds around 19,000 artifacts, an assortment of historical artifacts that illustrate the life and times of Gerald R. Ford. These objects include gifts received by the Gerald Ford throughout his life, including head of state and American bicentennial gifts received while President. The museum exhibitions were refreshed in 2017. 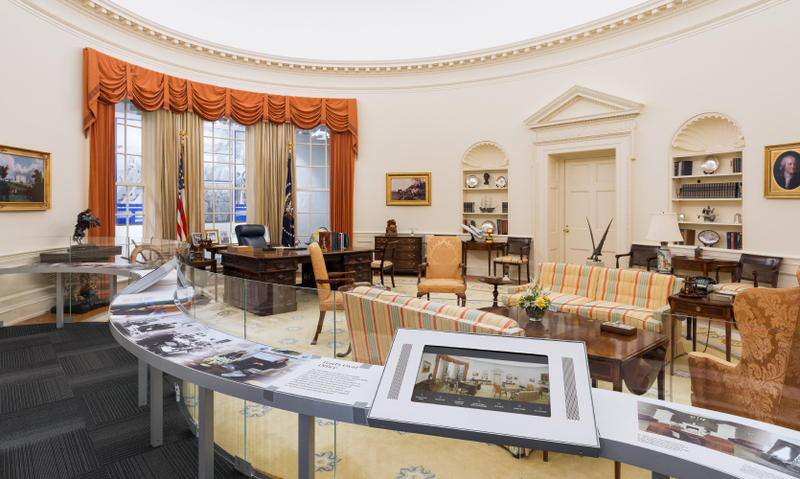 Highlights of the museum include a life-size replica of the Oval Office, a dramatic “Day in the Life of the President” presentation on 13 ft. screens, a walk-through cabin setting for the crucial Camp David Meetings exhibition, and an Interactive Map Table that takes you with the Carters to monitor elections and fight diseases. The Library's 300 acre site, about 45 miles from Los Angeles International Airport, represents the "shining city on a hill" often referenced by President Reagan and appropriately serves as the final resting place of the nation's 40th President. 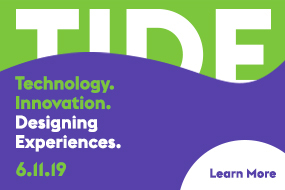 The library is a public policy center and national archive whose media-rich exhibition uses digital technology and draws upon an extensive electronic archive, a photo and video library and 80 million documents. Presidential correspondence, international agreements and gifts from heads of state provide a contextual backdrop to 16 multimedia alcoves. 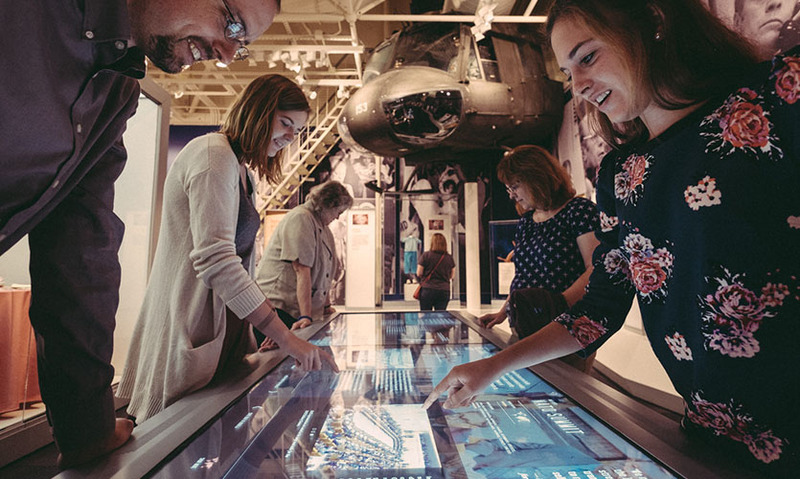 Organized around themes of Opportunity, Freedom, Compassion, and Service, the museum presents a highly interactive experience in which visitors can explore the nature of Presidential leadership. The Obama Foundation is constructing the Obama Presidential Center on Chicago's South Side in Jackson Park. Its lower floors will house exhibitions that tell the Obamas’ story within the context of history: civil rights history, African-American history, the history of Chicago, and United States history. The library will be fully digitized and documents will be made available to the public in 2022.